If you are looking for love, romance or friendship in a safe and secure environment, Aussie Match Maker is the definite hot spot for free dating ads. You will not be disappointed with the service and the online chat rooms made available. Looking for a Fireman? 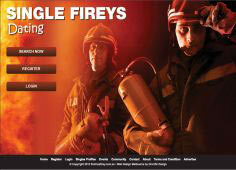 Australias only website dedicated to setting hearts on fire with single Firefighters accross the nation. So If you have dreamnt of meeting a hunky fireman then register now at Findmeafirey as we have just put the word out to 480 stations accross Australia that the ladies are looking for love! Looking for a Farmer? Meet Single farmers and country folk looking for love in Australia! 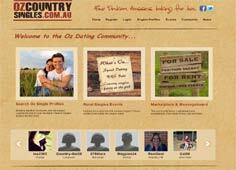 Inspired by the TV show The Farmer Wants A Wife, Oz brings together country and city singles from all over Australia. Enjoy dating with a difference with singles profiles, events, full interactive forum and a trading marketplace to buy and sell. Join the Oz Dating Community before June 30 2012 and get FREE 6 months full membership. (Enter promo code oz2012) Do'nt wait around for the next casting call... Find a farmer now at OZ! Australia's No. 1 Singles Site! More than 890,000 singles are members of RSVP. When you're serious about love! Online dating sites are great. Maybe you’ve been to one singles bar too many, you’re a single parent with no free time, or perhaps you’re the last in your social circle to still be single. Whatever the reason, you’ve probably considered the great possibilities of Internet dating. It’s a fantastic way to meet people and to find a future partner. These dating sites are a recent phenomenon, having tripled in the last ten years; Mr. or Mrs. Right could be right around the corner for you. These web sites have made it a lot easier for people to connect with each other, especially with the person that you have things in common with. You can search people by their age, sexual status, gender and many many more options. The popularity of these sites continues to grow at a very fast rate. The online dating industry offers people everywhere the opportunity to meet smart, attractive, and successful singles in a fun, safe, and secure environment. There are plenty of people from a broad spectrum of backgrounds and lifestyles you can look through, its amazing the people you can find. There are dating sites where you can pay a monthly fee but also free dating sites where you can set up an account for free. Free dating sites are based on the principles that online dating should be fun, free, and easy. You don’t have to pull out your credit card for these sites and the searching for partners can be endless. So whether free dating sites or paying online dating sites is your thing both offer single people of all ages and genders a fantastic and great way to hook up with the person you are looking for. These dating sites offer customers and users a vibrant and interactive community where Australia's singles can gather. Set yourself up for success by stepping inside. It can quickly connect you to local, like-minded singles and gives you many ways to interact. So if you’re looking for deep levels of compatibility or just some good old flirting, online dating sites offer a great way to jump in the deep end with someone.